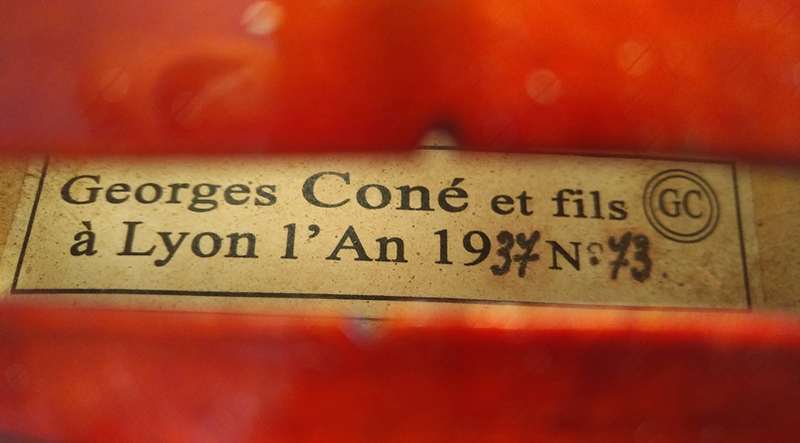 Home Violins WORKED OVER AND OPTIMIZED Georges Coné: Fine French violin no. 73. Lyon, 1937 - violinist's recommendation! This French master violin is a flawless manifestation of the mature personal style of Georges Coné. This fine violin #73, a piece dated 1937, which deserved the recommendation of a professional 1st violinist of a major Munich professional Orchestra, serves as a milestone in the biography of this extremely productive luthier, as it was created in a phase in which Coné worked under ideal conditions. Nine years prior to this time, he had returned to Lyon to take over the workshop of Emile Boulangeot – a return home to Boulangeot’s house, which was both where their joint teacher, Paul Blanchard, had set up his workshop, and also the place where Coné himself spent the first 16 years of his working life. As the luthier of the conservatory and Lyon’s philharmonic orchestra, Coné had steady business, but he also enjoyed the ongoing and intense contact to outstanding musicians. Coné was very well situated at this time, and the excellent quality and the richly detailed distinctive style of this instrument reflects this. The deeply flamed maple he selected for the one-piece back is an exceptionally fine-quality tone wood that offers both superior acoustic properties and an entrancing aesthetic. Its spectacular grain gives a magnificent historic character to the luminous deep wine-red varnish with its elegant crackling. The blackened edges of the scroll show Coné’s love of detail which also shaped the flawlessly carved sound holes that are unmistakably the work of his hands. The most convincing aspect of his mastery, however, is the large sound this attractive instrument produces, a voice with a clarity and strength that satisfies soloist standards. Radiant in its upper registers, it also features a delightful power and maturity in the lower registers as well. The violin came to us in undamaged and well-preserved condition and was carefully set up by the experts at our workshop so that it is now at its finest and ready to play. Its perfect balance across the strings will open up a rich repertoire of acoustic options for sophisticated musicians.